There is much to report here. We hear from Steve Kleinedler, President of the Society, Kory Stamper, Executive Secretary, Ed Finegan, editor of our journal, Michael Hancher, who is in charge of our social media presence, Rebecca Shapiro, who reports on MetroLex, and Cinda May, who describes the application for a Warren N. Cordell Research Fellowship. We also present the DSNA Professional Standards and Code of Conduct. In my capacity as DSNA President, and on behalf of the Executive Board, I would like to thank and acknowledge members for their work with the Society. Additionally, the process which was undertaken to have Dictionaries indexed by SCOPUS was extremely long and arduous: the driving force of Michael Adams along with Ed Finegan, Luanne von Schneidemesser, and Rebecca Shapiro for keeping track of and executing all of the necessary requirements that made this happen. (Thanks and acknowledgment also goes to Luanne for her service in her tenure as president, and to Rebecca for her service in her tenure as executive secretary.) The semiannual publication schedule and the indexing by SCOPUS are both crucial items for increasing journal revenue. By the time this newsletter comes out, the completely overhauled website will mostly likely have been unveiled. For that, we have David Jost and the Publications Committee to thank for shepherding that process along. In her role as executive secretary, Kory Stamper has streamlined the membership database, which, on the new website, will allow members the opportunity to track their membership and edit their membership profiles quickly and easily. Kory has also set up accounts to automatically renew, again increasing Society revenue without requiring someone’s time to track down people each year. Thank you also to David Jost and Peter Chipman for their role in producing the newsletter. Thank you to Michael Hancher and Orin Hargraves for administrating the Society’s social media. Lastly, a proactive thank-you to Michael Adams for the work he will soon be undertaking with regard to the biennial conference in Bloomington in 2019, which will be held in conjunction with SHEL. It is my hope that you all continue to benefit from your membership in the Society, and I look forward to reading your articles in future issues and seeing you in person at future conferences. The work of the Executive Secretary is entirely behind the scenes, so much of what I’ve done in these first months of my term is (and should be) invisible to members of the Society—though you have no doubt already noticed a few changes to how we’ve traditionally done things. In October, your Board voted to accept a Professional Standards and Code of Conduct for the DSNA (you can find it in this Newsletter). Such statements are increasingly commonplace among academic societies, and we’re starting to see vendors and conference sponsors require societies to have a Standards Document in place before they will do business with that society. We’re grateful for the help of our sister societies in the American Council of Learned Societies for their help in drafting this. In July, the DSNA transitioned to an online membership management system used and recommended by many nonprofits and academic societies (WildApricot). The advantages of this new system are tremendous for both the Society and its members: it gives each member a login with which they can change their own contact information, update their academic interests, and easily renew their membership; it fully automates the renewal and membership application process, and even allows for DSNA members to set up an auto-renewal option through PayPal; and it makes communicating with our membership much, much simpler. It’s not without its quirks, but I’m grateful that the transition has been so seamless, and that each of you who have encountered the new system have taken to it with grace and good humor. In the event that you haven’t yet logged in to the system, please do. One of the exciting things that this software offers is the ability to build a members-only section of our website, and your login to the membership system will be your login to the members-only section of the site, where we’ll no doubt have some form of the long-awaited membership directory, as well as members-only announcements and registrations (such as for DSNA21). If you don’t know what your login is, please email me at DSNAadmin@gmail.com, and I will get you set up. My other primary duty is handling the DSNA finances. Last year was a transition year for the DSNA: our Publications Committee commissioned the creation of a new DSNA website to bring us out of the Geocities era, and our journal became a semiannual publication instead of an annual publication. Both of these very necessary moves required one-time costs for the website and new regular expenses with regard to the journal—with no immediate financial return in the same calendar year. We still had a budget surplus in 2017, but it was relatively small. Fortunately, your Board has taken steps to limit costs while increasing our revenue. Thanks to the increased frequency of publication as well as new indexing for the journal, we expect to see an increase in our revenue through Project MUSE and DeepDyve in the coming years, and we have increased the cost of Institutional memberships slightly to help offset the increased costs of publication. We also eliminated the paid Secretary Assistant position in July, and have been working to reduce mailing and printing costs by tightening up our journals claims procedure. Bring in new members! There’s not just a financial benefit for the Society, but the benefit of bringing in new voices, research, and growth to our field. If you have access to Project MUSE through an institution that you’re affiliated with, such as a school or library, access Dictionaries through your institution and not your DSNA membership. DSNA does not receive income from member logins, but we do receive income from institutional downloads. Set your contact preferences for electronic communication! Printing and postage costs can be surprisingly large for a society of our size. We’re grateful for all the members who have already opted in to the electronic newsletter and electronic communications. Thanks for your continued support of the DSNA! Dictionaries 38.2 was published in December and is available through Project MUSE. 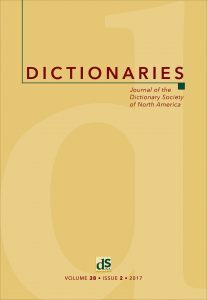 The issue contains two articles, “Dating Phonological Change on the Basis of Eighteenth-Century British English Dictionaries and Orthoepic Treatises” by Nicolas Trapateau and “Specialized Subject-Matter Labels: Exodistinctive versus Endoprofiling” by Danko Šipka, as well as two Reference Works in Progress pieces, Lynda Mugglestone’s “Words in War-Time Project” and David-Antoine Williams’s “Getting More Out of the Oxford English Dictionary (by Putting More In).” The issue also contains Antonette diPaolo Healey’s review of The Oxford Handbook of Lexicography, edited by Philip Durkin; Edward Finegan’s review of Garner’s Modern English Usage by Bryan A. Garner; Enid Pearsons’s review of The Word Detective: Searching for the Meaning of It All at the Oxford English Dictionary—A Memoir by John Simpson; and Sungok Hong’s review of Negotiating Languages: Urdu, Hindi, and the Definition of Modern South Asia by Walter Hakala. Dictionaries is aiming to publish a forum on modern lay lexicography in a forthcoming issue. The scope of the topic remains flexible but could include treatments of collaboratively edited and crowd-sourced dictionaries; dictionaries of previously undocumented languages created by missionaries and others with little or no lexicographical training; popular booklets published to tout local varieties of languages and guides to local flora, fauna, and other features; and lay definitions in advertising and branding contexts. Keep an eye peeled for a proper call for papers in due course. Meanwhile, inquiries and suggestions about possible contributions from DSNA members and others interested in the topic can be sent to the journal’s editor: Finegan@USC.edu. Until recently the MLA had an established Discussion Group for Lexicography. It was not always very active — I remember attending one MLA Lexicography session where none of the organizers or panelists showed up. Fortunately a half dozen audience members did show up (including the president of Merriam-Webster), who spent an enjoyable hour sharing their thoughts about lexicography. In later years Lisa Berglund and I managed to revive the Lex. discussion group, and we hosted some good sessions devoted to dictionaries. But then the MLA embarked on a complete redesign of its convention structure, and was about to subsume Lexicography into a new Theory and Method (TM) division called Book History and Print Culture — an objectionable move that Lisa and I objected to (traces survive at https://mla.hcommons.org/?s=lexicography), not entirely without effect. In the end the MLA agreed to keep the banner of Lexicography flying in the revised TM title: Book History, Print Cultures, Lexicography. Rebecca Shapiro was recently elected to a five-year term on the executive committee of that forum (https://www.mla.org/About-Us/Governance/Elections/Results-of-the-2017-MLA-Elections). I expect that she will sustain lexicography in future MLA conferences. This forum has an MLA Commons web site, with 275 subscribers, at https://mla.hcommons.org/groups/book-history-print-cultures-lexicography/ — which is probably the URL that we should link to. The most recent posting there is the CFP for the next convention, on a broad topic at least potentially lexicographic: Cut, Copy, Paste, Track. How do we study the expansion, contraction, and development of material texts and corpora? Papers sought that explore erasure, cancellation, deletion, supplementation, and textual change. The most recent installment of MetroLex, our periodic panel of talks and workshops on lexicography in NYC, was on Friday, September 29, 2017 at our now-regular location, Columbia University. We have been lucky to have found a home, with our genial host John McWhorter and his lively students, who faithfully come and share their knowledge, experiences, and interests at these events. Last fall, for example, we heard about how digitization can make an enormous difference in how information is pulled together and organized in the service of etymology and charting changes in meaning, by Angus Grieve-Smith of Columbia University and John Morse of Merriam-Webster. Angus’s discussion was called “The Challenge of Representativeness in the 1971 Trésor de la Langue Française Dictionary” and dealt with his online project about the etymology used in nineteenth-century French theater: Digital Parisian Stage Corpus. What was fascinating was that a specific resource traced language change and could explain how small differences in one field of literature and the spoken word trace linguistic change in a broad manner. What also was interesting about the talk was that theater during that time was particularly known for its layered meanings, so it is quite a rich resource for semantic variations. The second presentation, while different in topic, was similar in that it showed how technology in lexicographical research augments actual pairs of eyes. John’s talk was titled “The Metadata of an Offline Document: A Guided Tour through a Dictionary’s Work Galleys.” As with Angus’s talk, we were shown numerous slides—this time of galleys that had been worked on and adapted as a result of re-viewing and re-vising existing information. We saw clearly how changes were made in dictionaries based on hands-on research and work that combined old-school methods with new technologies. After the talks concluded, the audience engaged in spirited discussion that reflected the pleasing nature of the topics as well as how well they combined audience interests in history, semantic and lexical change, and lexicography in unusual, granular ways. It is clear that there is no shortage of fascinating topics related to dictionaries and lexicographical matters that remind us that new technologies cannot replace older, more established ways of creating corpora. The robots still work for us. This time, the presentations were made merrier by light refreshments provided by Oxford University Press. Previous talks have been refreshed by Cambridge University Press and American Heritage. We are also in tentative talks to hear Simon Tam of the musical group The Slants on winning their Supreme Court case and how they were able to name themselves something considered offensive by the U. S. Government. See a discussion here about disparagement and the First Amendment: http://www.scotusblog.com/case-files/cases/lee-v-tam/. If anyone in the NY Metro area would like to help with the planning of the Slants talk—as we think it might be a large draw—please contact Rebecca Shapiro at rshapiro@citytech.cuny.edu or Ben Zimmer at bgzimmer@gmail.com. The Warren N. Cordell Research Fellowship is awarded each year to support scholarly research in the holdings of the Cordell Collection of Dictionaries in the fields of lexicography, lexicology, the history of English and other languages, or related areas. An award of $2,000.00 will be made to the selected fellow after completion of research in the collection. Applicants must submit a letter of inquiry, a selective vita, a written proposal describing the research project, and a detailed travel budget. Applications are accepted at any time during the calendar year. The letter of inquiry should include the desired starting and concluding dates of the residency. The proposal should indicate the materials or range of materials within the Cordell Collection that will be consulted. Send proposals to: Cinda A. May, Chairperson; Special Collections Department; Cunningham Memorial Library; 510 North 6 ½ Street; Terre Haute, IN 47809; or via email at Cinda.May@indstate.edu. DSNA members have benefited from this fellowship over the years. See the article by David Vancil in the Fall 2016 Newsletter. Harassment and unprofessional conduct, in any form, prevent us from carrying out our mandate of fostering a spirit of collegiality and support. Such conduct may jeopardize a member’s participation in DSNA events or their membership. If an individual believes that she or he has experienced harassment as outlined above at the Society’s meetings or events, the individual is requested to report it immediately to a member of the Executive Board and/or the President of the Society.